Wahl has been making quality hair clippers since 1919 when founder Leo J. Wahl filed a patent for a hair clipper with an electromagnetic motor. 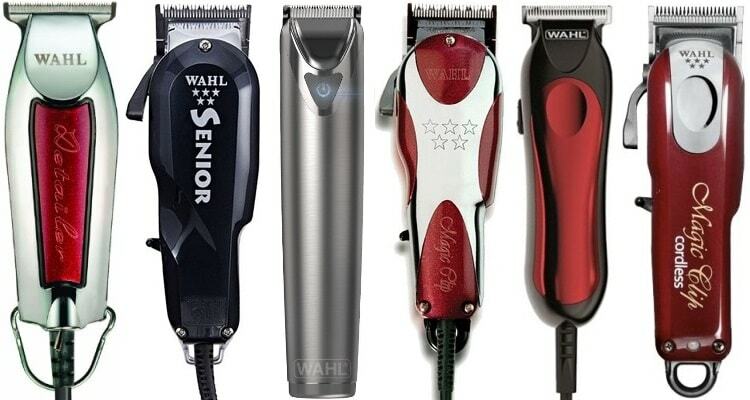 Since then, Wahl has expanded its array of products to include an extended assortment of clipper models. All of the Wahl clippers you can choose from have useful features that work to your advantage. 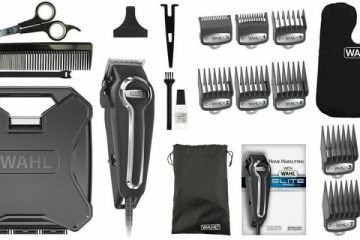 It helps to look at the ten best Wahl clippers that you can use for all your basic clipping needs. Many of these clippers are designed with specific trimming and cutting needs in mind. The general technical points of these clippers show how diverse the assortment of clippers is like. What Makes Wahl the Top Name In the World of Hair Clipping Tools? Start your search for a quality clipper by seeing what this first option has to offer. The Lithium Ion Trimmer has a firm battery that ensures a safe approach without any added wires. The patented blade design of the clipper set mixes well with the stainless steel body that houses everything. The self-sharpening blades produce a closer cut that is easy to prepare and maintain. You can also use one of four attachments for getting the clipper to work. You can use many choices like a traditional T-blade for trimming and grooming, a precision detailer for close cuts, a detail shaver for outlining needs, and an ear and nose trimmer. All four of these attachments are easy to add and remove from the top part of the clipper set. Don’t forget about the twelve attachment combs that go up to one inch in length. The battery is a lithium-ion model that lasts for about four hours on a single charge. You can fully charge the battery in about an hour. Also, you can use a one-minute charge to get three minutes of battery power. I like how Wahl makes this set with an assortment of helpful attachments. In addition to a narrow material for tight spaces, I can also use the attachment combs to help with longer bits of hair. The battery lasts for a while, a point that I appreciate for when I travel and need something that can last. The LED charge indicator on the stainless steel body helps me to see when the battery is running out of power and when I need to recharge the unit. The included blade brush helps maintain and clean out the set without issues. It is also easy for me to add oil to the blades without the oil smearing. The stainless steel body does not have any contours or grooved spots for helping me to get a better grip. The clipper can slip out of my hand if it is too wet. Being able to produce a smooth and gentle cut is a necessity for a trimmer. 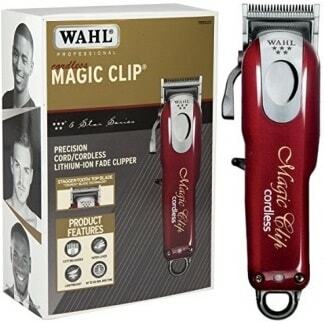 The Wahl Magic Clip provides you with such a cut thanks to its firm blades. The stagger-tooth blade layout on the Magic Clip uses taller teeth that mix in with smaller ones. The two move together when trimming to create a more efficient cut every time. You have two options to work with when getting the Magic Clip powered up. First, you can use the lithium-ion battery for a 90-minute charge. It takes about two hours to get the battery charged up. Second, you can keep the clipper plugged into a wall outlet and use the power from the electric cord to get a consistent flow of energy. The body comes with a reinforced plastic surface and remains light in weight even when the cord is added. The unit is about ten ounces in weight and comes with some curves on each side to give you a firm grip with either hand. Don’t forget about the taper lever at the top. The lever lets you switch from a short to long cut. I like how I can use this in wet or dry conditions alike. The blades move through hair even when it is damp. The cord or battery is not going to be hurt by the wet conditions in the hair. 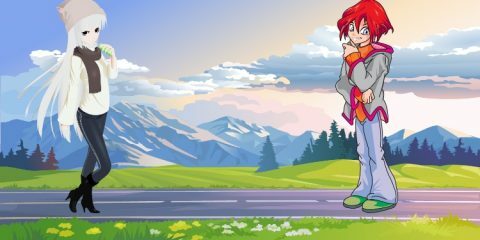 I was able to switch from one cutting setup to another in moments. The taper lever at the top part provided me with a simple setup for managing the blade length. The eight attachment combs were also helpful for giving me more control over the cutting process. The device is also easy to clean out. I can use a standard brush blade to clear out any old bits of hair. I can also run the motor in a cleaning solution to get into some of the deepest spots. The motor can vibrate a bit when running, which can be a bother. The motor is also noisy. But at least the unit does not become unnecessarily hot with use. It is a necessity to see that your hair clipper offers support for many hair lengths. 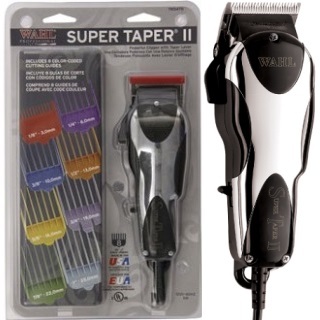 The Super Taper II is one of the best Wahl hair clippers to use for how it offers eight attachments for tapering needs. The clipper set offers eight color-coded combs from 1/8-inch to 1-inch in size. You can use these for longer hair points or for when you are trying to produce a better fade or taper setup. The taper lever at the top also adds a convenient approach to handling your trimming needs. The lever moves the blades between two positions for long and short lengths. The 8-foot electric cord used for powering up the Super Taper II is flexible and light in weight. The coating resists difficult chemicals that you might use in the hair styling process, thus producing a safe surface for your cutting needs. The stainless steel design includes a solid curve that adds a gentle approach for handling your cutting needs. The unit allows for you to bend the trimmer around different angles around the head, thus producing an even cut. It is easy for me to secure the attachment combs onto the trimmer. The combs also stay intact and are not likely to accidentally come off when I use them. These plastic materials also appear to be reinforced, so I can keep on using these without worrying about anything bending up. The body does not vibrate or produce lots of heat. I especially like that the motor is housed well enough with a stronger design to keep noises from being too loud. The taper lever offers a simple interface. I had a much easier time with switching the lever between positions so I could get a better cut running. Also, the power lever on the bottom does not get in the way of my hand as I use this. The stainless steel body feels heavier than most other models. It is often tough to clean off the blades, although the included attachment combs are easy to care for. The blades on a clipper set are vital for any cutting task. The Elite Pro set from Wahl offers blades that are firm and can cut through hair in moments. The narrow blades on this model offer a closer cut all the way through. The self-sharpening blades ensure that even the roughest bits of hair can be cut evenly. The cutting process is smooth and gentle. The ten included guide combs are made with thick materials that last longer and will not crack or bend with use. The large nameplates on these combs ensure you can get a better cut every time. A two-position taper lever helps you adjust how the unit cuts in any position. An 8-foot cord is utilized for providing the trimmer with power. The motor produces extra power for getting through the tightest spaces around the hair. The set comes with styling shears for your convenience. These shears include sharp blades while offering a body that works in either hand. A styling comb is also included to guide your way through areas where you would require the shears. My favorite part of this trimmer is that it goes through all types of hair in moments. I can use this model for both close sideburn hair and for longer and thinner bits of hair around the top. The added motor power made a difference in helping me to get a cleaner cut all the way through. The guide combs and the separate styling comb helped me with moving the hair that needed to be trimmed the right way. The combs do not break apart or bend, nor do they come loose on the base of the trimmer when used right. I was impressed with how well the design was laid out. A stainless steel attachment clip is also included for helping me to secure those combs in moments. The cord is rigid and does not bend all that well. The coating seems to be a little thicker, so I have to ensure I position the trimmer the right way when using it. People who are balding need clippers that provide closer cuts to make it easier for an entirely clean look to work. But a close trim can also be used in cases where a distinct tapering effect is needed on the sides. The Balding Clipper works for both of these intentions. The titanium cutting blades work at the top of the steel clipper unit to produce a clean cut every time. The blades sharpen themselves for long-lasting results. Two attachment combs are also included for when you’ve got to keep the hair organized for tapering effects or other unique design efforts you wish to utilize. The steel body has a few grooves on the side for supporting your hand. This includes a surface on one part for helping you to secure your thumb flat on a surface for your convenience. The power source comes from an 8-foot cord. The cord is light in weight as the clipper remains at less than two pounds even when that added cord is considered. The power switch is also positioned in a far enough spot to be easy to use while not getting in anyone’s way when cutting. I did not have any problems with producing bald cuts when using this clipper. The blades did not snag on the hair, nor did they cause irritation on anyone’s head. The even cuts produce a firm design that allows the hair to be trimmed gently in a matter of moments to produce a firm look all around. The blade lasts for a while and keeps a consistent cut all around. I did not struggle with trying to produce a cut, nor did the model slow down when I was getting through some of the tightest spots on the cut. The smooth layout provided me with more control without having to change how I was moving the clipper during the cutting process. 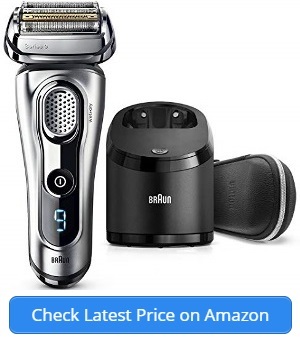 I would have liked this model more if it had a tapering lever, although I assume that feature was not required because the clipper is supposed to target the shortest bits of hair. Many of the guide combs you would find with the best Wahl trimmer options are designed to target the narrowest spots around the hair. This Wahl clipper model includes a diverse array of such combs. Two of the thirteen combs included in this clipper set are taper combs for each ear. The combs are divided between the left and right ears to produce a more accurate cut for each side of the head without struggling to get into certain angles when trimming. You can even use separate combs for trimming hair around the eyes and for sculpting the eyebrows to produce an even cut all around. The narrow and precise blades link up to a taper lever for your choice of cutting lengths. You can use the taper feature with any of the combs included in the set. The heavy-duty motor ensures that the clipper will keep on moving through the hair. The unit is powered up through an eight-foot electric cord. The cord produces a secure amount of power while keeping the motor running at the same speed all the way. The assortment of combs on this Wahl clipper is helpful, but my favorite part of this trimmer is that it includes a better grip. The top part has a thumb space to help me keep a firm hold on the trimmer. 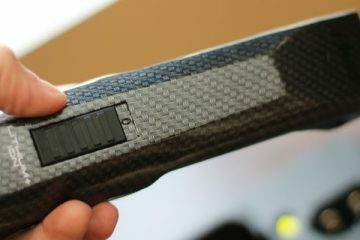 The rubberized surface on that grip also ensures the trimmer will not slip out. The secure housing also produces very few vibrations. I was impressed with the assorted attachments that this clipper set comes with. 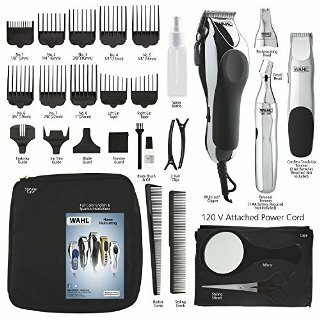 Wahl even included a pair of hair clips, a set of premium styling shears, and separate barber and styling combs for my use. The power switch was far off at the end to keep it from getting caught in anything I was wearing. The taper lever also provides a better hold for cuts. The clipper seems to get a little warmer with each use. I have to keep the power off for a bit in between cutting jobs to keep the heat from being too intense. While many of the best Wahl clippers you have read about here include several convenient choices, this model is a little different. There are two separate devices included in this set that work with specific cutting needs in mind. First, you will use a basic cutting tool that operates on a lithium-ion battery. The battery runs for two hours on a full charge. You can use the quick charge feature to get a small amount of power for a shave ready in ten minutes. A detail trimmer is included with similar blades and a near-identical grip, but with a smaller size. The trimmer also uses two AA batteries. Both devices use snag-free blades that go through hair in moments. The blades will not cause the motor to slow down even when you are going through wet hair. The extensive array of guide combs includes some for the ears and brows. The design produces a firm design for cutting that works in moments and keeps a clean cut all the way through. The combs are not going to slip off of the main trimmer body. The powerful motor on this clipper set is my favorite feature. I appreciate how the power produced is consistent during each cutting task. Even when I use the small detail trimmer, I can be assured that the unit will keep a clean and smooth cut every time I use it. The battery lasts for a while and does not produce lots of heat. The housing can also handle a bit of water without causing the battery to wear out. This was useful as I can ensure I can get this through wet hair without worrying about the unit slowing down or breaking apart. The small contoured surface on each part was also a plus for me. I can use the surface to get a better grip all the way through. It takes about three to five hours to get either of the pieces on this set charged up all the way, although the process seems to take longer in some cases. 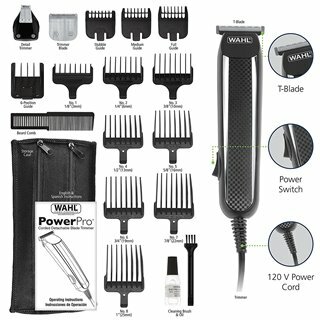 You will find that the Wahl Clipper PowerPro model is easier to handle than what you might find elsewhere. The grip includes a good texture that fits well for all your cutting tasks. The PowerPro uses a series of grooves on the top. You can secure either thumb on the top to produce a consistent cut all around. This all comes with a T-blade surface affixed on the top with support for many attachments, including a narrow detail trimmer. The guide combs provide support for seventeen cutting lengths. You can affix any of these combs to the top to create a consistent flow of power that moves along well without wearing out prematurely. You can even use a separate guide for stubble to produce an even layout. The high-torque motor produces a consistent cut that keeps on moving thanks to the eight-foot power cord used to keep the setup working. The fast motion of the motor ensures that hair can be trimmed all around without worrying about any bits of hair being pulled or tugged and possibly causing soreness around the skin. The variety of attachment features is a positive point that I liked about this trimmer. The layout features a useful all-around organization that adds a firm setup for cutting. The design is easy to apply around the skin and does not cause irritation when used accordingly. The assorted variety of cutting lengths was also a plus for me. I like how the trimmer offers different cutting lengths based on where I am trimming the hair. The design also provides a sensible setup for handling even the longest spaces around the head. The cord on this model was not too hard for me to use. I can get this option running well without the motor or other features being too hard to maintain or handle. Some of the longer combs are fragile. The longer teeth make it to where those combs might bend or warp if not used accordingly or with enough care for what you use. 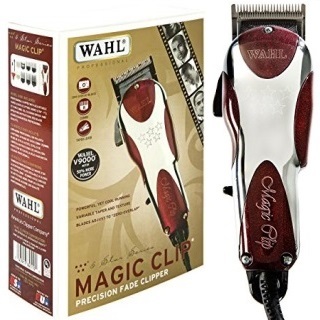 Those who want a fade cut can see what the Wahl Professional Magic Clip has to offer. This model uses a slim blade design to ensure even the tightest of fades can be supported. The Magic Clip uses zero-overlap blades that are carefully organized. The blades are supported with two tiers that are divided through a taper lever. The two lengths that you can utilize are vital for handling short and long hair for tapering effects. You can also use one of eight attachment combs to produce a closer cut that allows for hair to be organized and laid out along the trimmer for a proper guide and even layout. A stainless steel body is included on this trimmer to provide a better grip that you can utilize. The sides are contoured for a firm hold all the way through. The motor on the inside also produces extra power without generating unwanted vibrations or heat. The eight-foot power cord ensures that the unit will continue to clip hair without slowing down or overheating; the cord is also flexible and light in weight. I was amazed at how light in weight this clipper is. The device is a little under a pound in weight even when the cord is considered. The cord is still firm and flexible even with that lightweight body. The electromagnetic motor worked quite well while ensuring that it would not bother my hand when I was using the trimmer. This Wahl model offers a firm design that I can use in either hand. I could use this on several clients in a day, and the model still continues to work like a charm. I did not struggle with trying to clean the brush head or oil it either. The taper lever responds to my adjustment control in moments. The unit switches quite well to produce a smooth surface for trimming all around. The body does not have much of a grooved surface on its body. Although the body adds a nice grip, it would be easier for me to use this if there were sturdy grooves all around. The last of the options to see is a more comprehensive set that includes more than just a Wahl clipper. 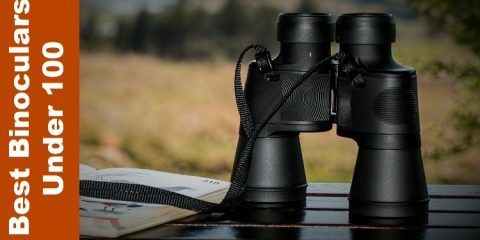 The set has two added items for taking care of more intensive details. First, the main clipper set uses a steel body with a curved layout and a slightly rubberized surface on the front. There is a flat surface for your thumb to rest on for when you need to get a better grip. The unit works with an eight-foot cord for power and a taper lever near the top. You can also use various attachments on this model, including taper guides for both ears and a smaller guide for brow hair. Second, a touch-up trimmer that runs on two AA batteries is included. The design includes a smaller series of blades for closer trims that you might have missed with the larger device. The third piece is a personal trimmer that uses one AA battery. You can use either a detail head for slim spaces or a reciprocating head for nose and ear trimming needs. The personal trimmer works in wet and dry conditions and can be safely rinsed off for cleaning purposes. I was impressed with how well Wahl set up the clipper set. The three parts are all easy to grip on with either hand. The attachments for the main body were useful and worked with both tapering lengths. The added styling shears and small mirror included in the set helped me with finding spots that needed extra care, not to mention to help me see some of those spots quite well. The arrangement of each device is easy to handle without worrying about lots of vibrations coming in the way. I can get each item prepared for clipping needs in seconds. The cord used for power on the main body also adds enough power while keeping the motor running without slowing down with use. The batteries for the two smaller units tend to run out quickly. At least the housings for the AA batteries are secured and will not become damp if either unit gets wet. Wahl has become a big name in the hair clipping world thanks to its use of electromagnetic motors. An electromagnetic motor is quiet and uses less power than most other models. There are also fewer moving parts inside the motor, thus ensuring the unit can last for years. The fast speed of an electromagnetic motor is another plus; you can get a motor to work at around 14,000 strokes per minute or SPM. You can use a Wahl clipper with ease regardless of which hand you prefer to hold the clipper with. The designs of each clipper from Wahl include curved or textured bodies for helping you keep a firm grip on the unit. You can use your grip to ensure that the trimmer will not slip out of your hand while you use the model. The lightweight bodies on these clippers are very useful as well. 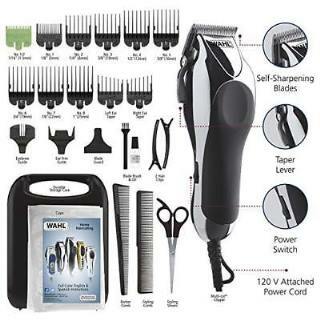 You can find Wahl clippers with one of two power sources. You can find some models with lithium-ion batteries that allow for cordless use. Such a battery will not take long to charge up. You can even use a quick-charging feature to get a small bit of battery power ready in minutes. Other models use a cord for power. A cord may be designed with a long and firm body while still being flexible. 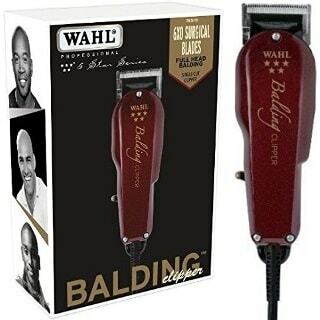 The blades that Wahl offers for its clippers are very powerful and will not wear out over time. These blades include firm steel surfaces that do not rust or wear out from regular use. The individual teeth are separated from each other to prevent them from overlapping. Don’t forget about the tapering levers found on many clippers to help you with moving the clipper from one point to another. You can get one of these Wahl clippers maintained in a few moments. You can wash out the clipper with a traditional cleaning solution, although water may be utilized in some cases. Many Wahl models are designed with waterproof surfaces to ensure that you can get them cleaned off in between uses. You can also add oil to the blades before and after each use to keep them lubricated; the oil will adhere itself well onto the steel blades without dripping along the clipper’s housing. Wahl understands that all people have specific needs for their trimming needs. Therefore, the company offers many attachments for its trimmers that are suitable for all your cutting needs. You can find many attachments like tapering pieces for the ears, brow trimmers, guide combs for fades, and guards for keeping the blades secure in between uses. Some models even come with separate battery-powered trimmers that target smaller spaces you might have missed or need to spend some extra time controlling. Step-1: Clean off and oil the clipper. Use a cleaning solution or water to wash off the blades on the clipper. Add oil around the blades to ensure they will stay lubricated. Step-2: Make sure the Wahl clipper is prepared accordingly. Look at the guide comb attachment or cutting setting you will utilize. The attachment should be measured based on how long a person’s hair is. Many of the guide combs you can utilize are labeled with a number specifying the length of the comb. Step-3: Wash a person’s hair at the start. It is easier to use a Wahl clipper when the person’s hair is washed off. It will be easier to comb the hair and to keep any weaves or bends in the hair from getting in the way of the cutting process. You can dry the hair if you desire, although many Wahl clipper models work on wet hair. Step-4: Start by working with the longest blade guard length. You have to start by clipping the longest hair. You might have to go through the entire hair area once before moving on to a smaller blade guard. Step-5: Move your clipper against the growth of the hair. Moving against the growth helps you to lift more bits of hair to get a closer cut. The process also keeps you from pulling or tugging on hair, thus preventing irritation and the development of ingrown hairs. Step-6: After you have passed over the entire head once, you can move on to a shorter blade guard or taper setting. You should work with a closer cut after much of the hair has been removed. The strokes you apply should be organized evenly. Step-7: Brush out the clipper on occasion during the hair cutting process. Getting the hair cleared out a few times while cutting the hair ensures that the blades will remain open and able to cut through hair evenly. Step-8: Use the smaller tapering materials for producing curved effects or closer trims around smaller areas. These include spots around the ears or brows. Step-9: Clean off the blades once again after you are done trimming the hair. Be sure to use soap and water or an approved cleaning solution for your needs. You should also use a brush to get rid of any small bits of hair that are still in the clipper so the space will be clear for the next time you plan on using it. Step-10: Oil the blades once again. Keep the motor on while oiling so the lubricant will evenly go over the blades. 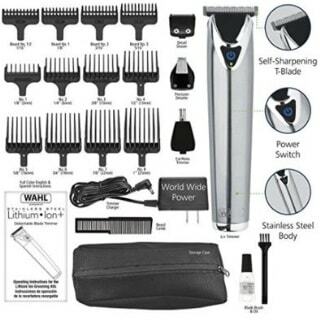 The Wahl Clipper Company has grown to be a popular name in the world of hair care products. The company was formed in 1919 a few years after Leo J. Wahl started experimenting with electromagnetic motors. In 1911, Wahl designed a vibrating massager that could be used on the hair to create a smooth cut. It would not take long for Wahl to get a patent for his vibrating electromagnetic motor. Over the years, Wahl sold his clippers to many people who were interested in finding sturdy and firm clippers that can last well. His company grew to offer hair dryers for cutting needs, curling brushes, combs, and various clipper attachments. The Wahl company has continued to grow well after Leo Wahl’s death in 1957. In 1967, the company produced a rechargeable battery-powered trimmer. The design proved to be as effective as a traditional cord-based trimmer unit. Wahl continues to be innovating in producing intriguing hair care and clipping products. The company even introduced a smaller Trim N Vac clipper model in 2001 designed with beard and mustache needs in mind while also using a vacuum to clean off shavings. Wahl products are currently available in more than 165 countries on all continents. 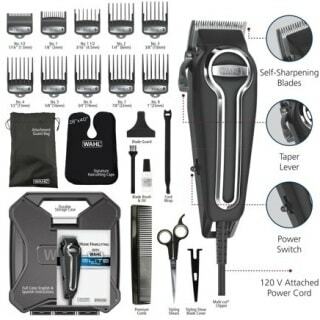 Our choice for the best Wahl clippers for trimming is the Wahl Clipper Trimmer 9818. This is a model that offers a more flexible body thanks to its cordless design. The various trimming length options make it an ideal choice to have for many trimming needs as well. All of these choices for a Wahl clipper will be useful no matter what you need to get. 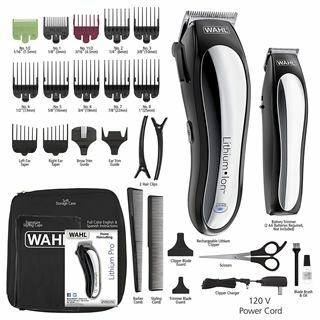 You will see that it is not hard for you to cut anyone’s hair when you have a sturdy clipper set from Wahl on hand for all the cutting needs you might have. Oster Octane Clipper Review: Is it Worth Your Money?